Sony's original requirement for a new home video tape shell was that it should be about the same size as a paperback book, thus making it easy to be carried in a pocket, and the running time of the tape should be sufficient to hold a complete feature film. At a size of 155 mm x 95 mm x 25 mm and a linear tape speed of 20 mm/s (NTSC) giving a maximum recording length of 120 minutes (L-500), the Betamax tape fulfils these requirements perfectly. The VHS tape being 190 mm x 105 mm x 25 mm has a higher linear tape speed making it larger and awkward to carry and wasteful of shelf space. Like all contemporary home video formats (Video 1500, Video 2000 and VHS), Betamax tape is a ferric oxide tape of width half an inch. The actual magnetic tape is interchangeable between the formats allowing manufacturers to produce tape which could then be spooled into shells of the desired format. From this table it can be seen that the naming of the tape refers to the length in feet (the length of the tape). This means that the PAL L-750 is the same tape as an NTSC L-750 with the only difference being the running time. Contrast this with the situation between an PAL E180 and a NTSC T180 which have the same running time but contain different lengths of tapes. In Europe, Sony's range of tapes was marketed under the name Dynamicron. At any one time each tape was available in two type, Standard and Ultrahigh grade (UHG). Over the years, Sony tapes went through several revisions beginning with mostly grey packaging. BASF were the first on the market with a non-ferric tape which was intended for use on the standard Betamax machine. This was a chrome dioxide formulation which was claimed to give improved picture reproduction. As Sony developed and improved the Betamax format by giving us Super Betamax (Super-BETA) and Extended Definition Betamax (ED-BETA) a higher performance tape formulation was also required. The traditional ferric tape formulation was superseded by a metal oxide formulations. The first of these tapes was the Pro-X tape which worked with the Super Beta Pro mode found on the SL-HF750 and SL-HF950. After this came tapes for the ED-BETA format. Sadly there are very few PAL ED-BETA machines available, in the NTSC market lots of models were produced and some are still available. Although Pro-X tapes were intended for use in Super Betamax format, they were often found by many as a high grade tape for the standard beta. One particularly good use was for PCM audio recordings. PAL ED-BETA machines are now only to be found in the middle eastern markets in countries such as Saudi Arabia and Israel. Other than Sony, a number of other manufactures produced tapes for the Betamax format. Not all of these manufacturers sold their tapes in the high street and were bundled with new VCRs. Brands such as Polaroid and Maxell were not available in all six tape length opting to sell only the popular L-500 (2 hour) and L-750 (3 hour) variants. Betamax tapes were available in the UK in the following brands BASF, Kodak, Maxell, Memorex, NEC, Polaroid, Sanyo, Scotch, TDK and Toshiba. One manufacturer Scotch promised a lifetime guarantee on all of its tapes. Do you remember the advert with the skeleton showing the SL-C7 however reportedly, people attempting to get them to honour this promise today, will be told that the lifetime guarantee has expired as the format is no longer supported which is evidently not the case! Now that new Betamax tapes are difficult to obtain, many users are turning to Betacam tapes. Betacam is a professional broadcast format which uses cassettes that are suitable for Betamax recorders. Although the price of new Betacam tapes is prohibitive, there is a plentiful supply of once used tapes. A nice feature about Betacam tapes are that most come with a reusable erase tab which can engaged or disengaged as required. Most Betacam tapes come in a nice plastic case similar to a Betamax library wallet making them easy to label and look good on a shelf! Some also came with a nice hook allowing them to be hung on a rod, a feature which was found useful in the Broadcast world. Note: only Oxide Betacam tapes are suitable for use with the Betamax format. Betacam SP tapes are a metal formulation tape and are not compatible with the Betamax format. They can cause excessive head wear and should be avoided at all costs. Due to highly increased running speed of a Betacam tape (about 6.5 times faster), a 20 minute Betacam tape works out as the equivalent of an L-500 and a 30 minute Betacam tape works out as the equivalent of an L-750. Betacam tapes of length greater than 30 minutes come in a much larger shell which will obviously not fit in a Betamax VCR. The small Betamax sized shells are used in the portable Betacam machines used in outside broadcasts with the larger shells being used in the studio. Compare this with VHS and VHS-C tapes. 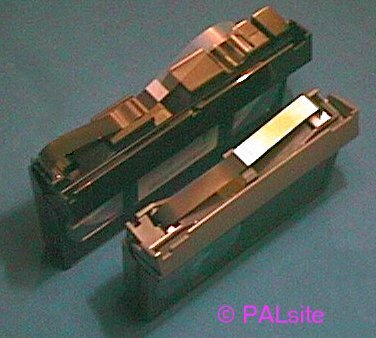 The other two lengths of Betacam tapes which can be used in Betamax machines are the 5 and 10 minute varieties. A number cleaning tapes were produced, this came in two varieties, wet and dry. These are used for cleaning the video heads and tape path. The wet variety is less harmful to the VCR. Note: all cleaning tapes should be used with extreme caution as they all work on the principle of applying a abrasive material on the video heads which at best causes head wear and at worst can damage the delicate video head tips. If you really need to use one of these cleaning tapes, they should be used sparingly and only in short bursts. If no improvement in picture quality is achieved after a couple of tape passes then further use of the cleaning head will be a waste of time and can only lead to head wear or damage. In which case you should either attempt to clean the video heads by opening the machine up and using a proper head cleaning swab and solution or the machine should be referred to a qualified service engineer. Sony produced several tapes for service engineers. The most useful of which is the SONY KR5-2H Alignment tape L-125 (PAL). This contained the following test patterns: Colour bars (for video system alignment), Monoscope (RF switching and azimuth adjustments), RF-sweep (video head preamplifier adjustments) and tracking (tape path adjustments). Also available is the torque measurement tape (forward torque and back tension measurement). This comprises of a conventional Betamax shell with two spring tension gauges located in place of the usual take up and supply spools. When the tape is played, the gauges give a readout of forward torque and back tension on the take up and supply spools respectively. These were heavily marketed by the trade who played on common myth that because the Betamax system did not unlace the tape whilst wind / rewind, there would be excessive head wear. It is undoubtedly the case that using a tape rewinder will result in less head wear but history has shown that the saving is marginal. The convenience factor of being able to go on and view another type and not have to wait for the previous cassette to rewind is perhaps a better reason for using one of these rewinders... an even better solution would be to own a second (or more) Betamax machine. In the UK, rewinders were available from high street shops such as Tandy (Radio Shack) and Dixons. Betamax leader tape consists of metallic material. The tape end sensors in the Beta format operate on an inductive system, with each sensor being a coil forming part of an oscillator tuned circuit. When they come into the proximity of the sensor, they cause it to saturate and the oscillator to stop. The benefit of this arrangement is smooth end detection and increased reliability compared with an optical arrangement which are particularly prone to failure of the optical emitter which on early VHS models was a tungsten lamp. When this failed, the machine becomes totally inoperable. See also the Betamax features page. Sony still supply Betamax tapes although they are now hard to find in the high street. For a list of supplies see our directory page. Sony's web site gives detail of both Betamax and Betacam tapes. It is sometimes quite surprising to find that not everyone is aware that video tapes like audio tapes also have a record tab. On a Betamax cassette this it is usually removed by using a small screwdriver thus stopping the tape from being recorded over accidentally. These can be re-covered if necessary using some sticky tape. Industrial models such as the SLO-1700 ignore the record tab and will record even if the tab has been removed. As these machines are often used for duplicator banks this makes sense as tapes with the tabs already removed can be used.